*Number of pixels shown at the 60dB level, when receiving a signal. The combination of the waterfall function and the real-time spectrum scope assists in maximum receive performance of the IC-7300 and increases QSO opportunities without missing weak signals. The waterfall function shows a change of signal strength over a period of time and allows you to fi nd weak signals that may not be apparent on the spectrum scope. The audio scope function can be used to observe various AF characteristics such as microphone compressor level, fi lter width, notch filter width and keying waveform in the CW mode. Either the transmit or receive audio can be displayed on the FFT scope with the waterfall function and the oscilloscope. The IC-7300 employs an RF direct sampling system. RF signals are directly converted to digital data and processed in the FPGA (Field-Programmable Gate Array), making it possible to simplify the circuit construction. This system is a leading technology making an epoch in amateur radio. The new “IP+” function improves 3rd order intercept point (IP3) performance. When a weak signal is received adjacent to strong interference, the AD converter is optimized against signal distortion. * Do not use the Enforced Tuning function except in case of an emergency. Transmission power may be reduced. 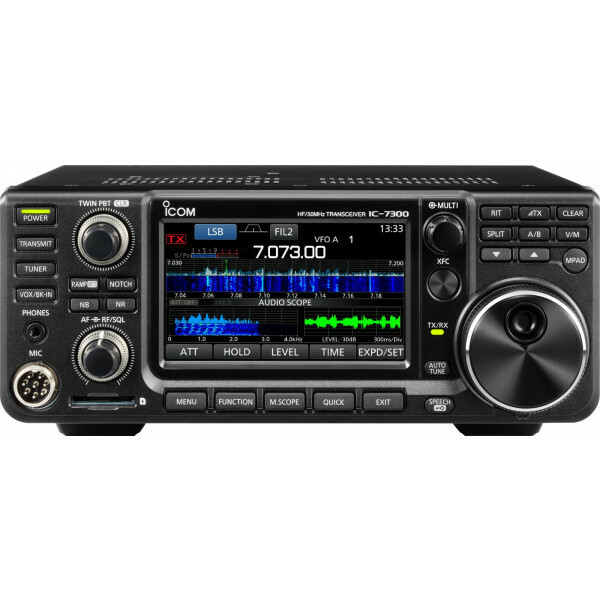 The IC-7300 can store various contents into SD card such as received and transmitted audio, voice memories, RTTY/CW memories, RTTY decode logs and captured screen images. Personal and fi rmware updating data can also be stored to the SD card for easy setting. Covers all HF and 50 MHz bands, provides clean, stable 1 kW output. Automatic antenna tuner and compact detachable controller are standard. Covers 3.5-30 MHz with a 7 m (23 ft) or longer wire antenna. Covers from 2 to 30MHz. Has a PL-259 connector. Easy to assemble (non-kink construction). Fiberglass mobile mounting antenna element for use with AH-740. Same as that supplied with the radio. 13.8V DC, 25A max. output. Compact, lightweight electret desktop microphone. For remote transceiver control from a PC equipped with an RS-232C port. For mounting the radio in a vehicle. Converts 13-pin ACC connector to 7-pin + 8-pin ACC connector for connection with IC-PW1/EURO. *Guaranteed range: 0.500-29.999, 50.000-54.000 MHz and 70.000-70.500 MHz.